Find all the local commercial or charity Halloween haunted houses in Oregon for 2018 here at Funtober. We have all the haunted hayrides, haunted houses, haunted trails, and more Halloween fun in Oregon. Funtober finds all the zombies, devils, witches, vampires, and zombies walking around your state. Enjoy a night out with your friends this Halloween at one of these local haunted attractions. 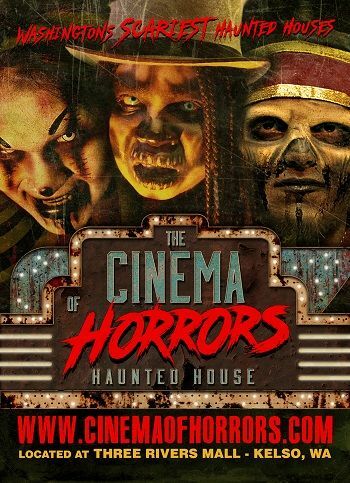 Find entertainment with Hollywood type set designs, air blasters, live actors, and spectacular costumes ready to bring in your face fright. Grand Opening night is September 21st. What’s behind the door on the 13th floor? Expect to find a military research laboratory of death and torture. This is a 13,000 square foot facility that takes about 30 minutes to complete. Tickets are $23. Doors open at 7 pm. Attraction closes at midnight on Friday and Saturday or 10 pm on other nights. It opens beginning late September and runs throughout most nights in October. Check web page for their calendar of open dates. This charity haunt has been in operation since 2007. It runs Friday, Saturday, and Sunday nights beginning October 12th through October 27th plus added dates Halloween week. Admission tickets are $8. As you might guess it is based on a circus and carnival theme of fright. Open nightly every Friday, Saturday, and Sunday in October. This yard haunt has scared visitors for well over 10 years. See creepy creatures and dazzling displays from the street. No cost but donations welcome. The fear begins on October 5th. Your ticket for terror is just $15 to Fear Asylum. Doors open at 7 pm and close at 11 pm on Friday and Saturday or 10 pm on Sunday. They also feature a 6:30 pm children’s haunted house. Don’t forget their onsite photo booth or monster midway games. It runs every Friday, Saturday, and Sunday nights in October. Sorry folks but Fright Town will not be open in 2018. This free open to the community haunt is open nightly in October from dusk until 10 PM. A full contact horror experience. The season begins September 28th. Doors open at 7 pm. The attractions are Carnival and House of Shadows. The attraction is open every Friday and Saturday nights in October. Also open added dates near Halloween. Check web page for details. Yes, assume this is an extreme haunt. Open every Thursday, Friday, and Saturday night in October. 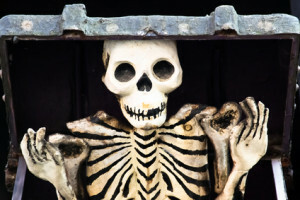 TOUR THE GRAVEYARD, FIELD OF FEAR, HAUNTED HOUSE, LIVESTOCK PEN, CAVE AND STROLL DOWN THE SPOOKY LANE. Sometimes you need to make a run for the border to find the nearest haunted house. If you didn’t find the one you want to attend among the Oregon haunted houses, try these neighboring states. Have you been to one of these haunted houses? I would love to hear what you thought. Did you have a good time? Was it worth the money? Would you recommend it to visitors here? Any tips to maximize the experience? I’ll gladly publish what you send me and give you a virtual hug. I need to update the 2015 information for the Chamber of Darkness haunted house in Monroe. You left out Bend all together..
At Clackamas County Fair Grounds. Cost $5.00 per person or $3.00 with Two cans of food. Just scream haunted house is the 27 and 28th 7pm-midnight at 711 E. Main Medford 5 dollar entry with an 2 $ extra for the “scream chamber” all proceeds go to The Southern Oregon Humane Society !! there is no fright town this year in Portland. I messaged them directly on facebook.